AUSTRALIAN MADE EQUIPMENT FRAMES, THE BEST IN BUSINESS BAR NONE. 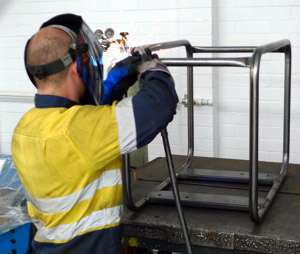 HOME > MEDIA > NEWS > AUSTRALIAN MADE EQUIPMENT FRAMES, THE BEST IN BUSINESS BAR NONE. Crommelins heavy duty steel frames are built in house to take the knocks in the field. The heavy duty tubular steel frame can be relied upon to protect your Generator, Drive Unit, Pressure Cleaner or Pump against misuse or accidental damage. And because they are now manufactured by Crommelins in Perth they are always available as a replacement part. Crommelins purchased the TRADE MADE frame business and moved it into a purpose built facility onsite in Welshpool WA, along with the specialist equipment, management and welding expertise to complete the package.